Upstairs we find the guidance computer, consoles, phone system, security & alarm panels and a host of other systems too numerous to mention. In a nutshell, this is the brains of the whole complex. 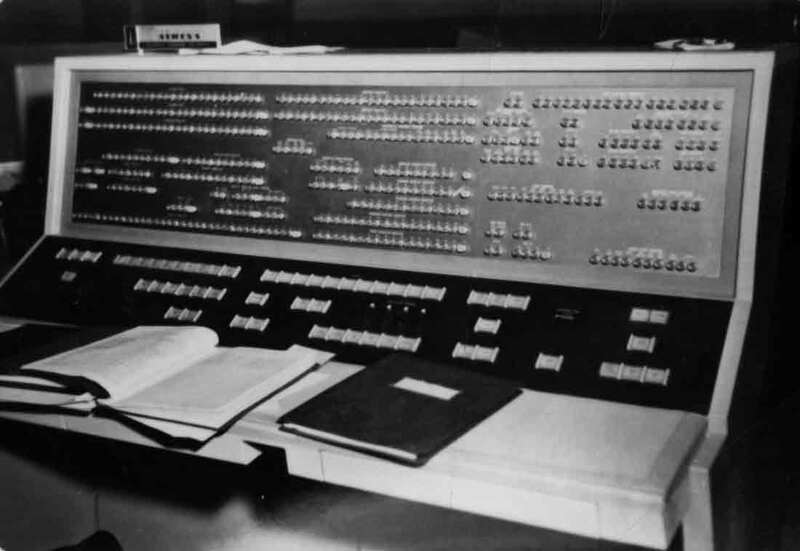 The console for the Remington Rand Univac Athena computer (foreground) in the upper level. Surrounded of course by scads of other Ground Operating Equipment (GOE). 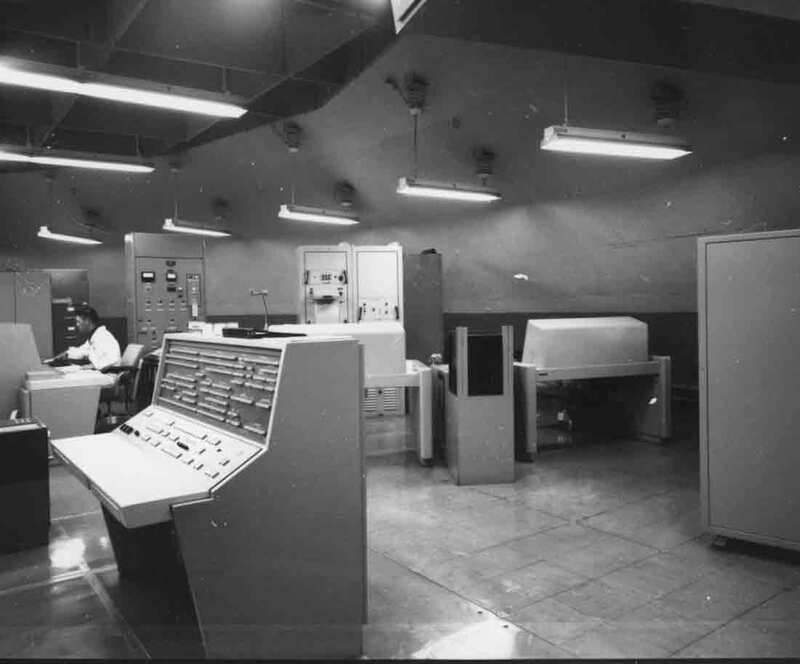 Looking in on the Operations room we see the Athena computer which handled the complex calculations for the missile's trajectory; the launch, guidance and facilities consoles; punch card readers, tape drives and a myriad of rack-mounted equipment. Yes, the Titan I was born during the era of punch cards. The guidance program, written by Bell Laboratories, consisted of a very large number of punched cards. Broken into various modules, or components, the individual silos were controlled by color-coded cards (each launcher with its own color: yellow, blue and red) which were read into memory and stored on paper tape. The Launch Console - "The Button" essentially. From this console, the Missile Launch Officer (MLO) and his crew, given the order, could have waged World War III. 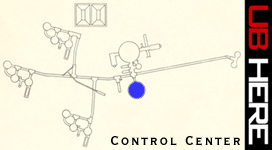 Once orders were received, this is where the majority of the action would take place until the missiles were away. After verifying their Emergency War Order (EWO) and entering the target selection (the DGZ, or Designated Ground Zero) the countdown checklist would proceed. The "MISSILE AND FACILITY" button on the launch console would initiate the long list of items required to rain hell down on the target until finally the "LIFT OFF" indicator would illuminate, signaling the point of no return. The missile is away. fully arm later after apogee. The huge 420-ton doors would groan open, slowly exposing the missile as its fueling completes and the silo is deluged with tens of thousands of gallons of water to protect it. The missile would rise slowly under it's massive weight, now fully laden with oxidizer (LOX) and fuel (RP-1), the launcher elevator groaning as it reaches the surface. The antenna, would emerge from its own silo and check its orientation and alignment, waiting for its call to guide the missile home. White vapor drifts off the missile as expanding LOX is relieved and underneath the missile, the flame deflector, a concrete lined steel scoop, is doused with water to protect it from the immense heat of the twin rocket engines of the Titan's Aerojet LR87 1st stage motor. Turbines in the first stage motor are spun up with pyrotechnics and the ignition is fired, re- leasing a huge could of gas, smoke, steam and fuel as the rocket nozzles transmit enorm- ous force from the missile. The umbilical tower separates with the firing of explosive bolts and falls away from the missile a ways leaving it clear; lanyards pull power, air conditioning, fuel, instrument and service lines free from the missile. Instruments measure the force of the motor's lift until it is at 70% thrust and then explosive bolts fire simultaneously to release the missile; their explosions completely drowned out by the incredible roar of the engines. It appears to rise slowly, almost drifting upward at first, but after only a few hundred feet it is already traveling well over 100 miles per hour. It would rise upward on a column of flame, eventually reaching over 7 miles per second (escape velocity) and would be lost from sight behind the Earth's curvature. After first stage burnout at about 35 miles up, more explosive bolts would separate it from the 2nd stage, warhead and re-entry vehicle. 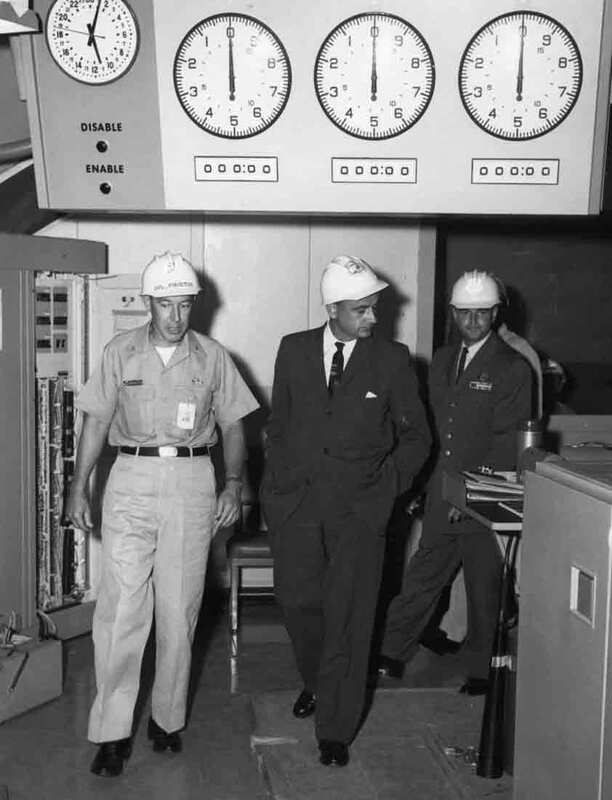 The Aerojet LR91, the 2nd stage engine, would fire up and continue on it's course as vernier nozzles continued making attitude corrections to keep the missile on target with a CEP* of 1400 meters (~.87 miles). Upon reaching an altitude of about 150 miles and a velocity of over 22,000 feet per second, 2nd stage separation would occur and vernier nozzles would make final course corrections and carry the re-entry vehicle and warhead on a ballistic trajectory, finally reaching an apogee of over 540 miles above the earth. Controlled only by gravity on the last leg of it's journey, the Titan I would descend on it's target at over 17,000 miles per hour! The Avco Mark-IV re-entry vehicle aboard the Titan I housed the 3.75 megaton W-38 warhead designed by University of California Radiation Laboratory (UCRL - Lawrence Livermore National Laboratory). It could deliver an airburst, detonating above it's target for a more destructive effect or detonate on impact for a less devastating attack. Time for the Titan I to travel a distance of 5,500 miles was about 33 minutes. * In the military science of ballistics, Circular Error Probability or circular error probable (CEP) is a simple measure of a weapon system's precision. It is defined as the radius of a circle into which a missile, bomb, or projectile will land at least half the time. Two more to go... Look out below! Each missile in turn would launch one at a time. The time required to get the bird in the air was said to be about 15 minutes for the first, and 11 minutes each for the 2nd and 3rd. Missiles could not be fired simultaneously because there was not enough power provided by the generators to lift more than one fueled missile to the surface at a time, and that the system was not designed for more than one countdown to progress at any one time. Once a Titan site had launched all it's missiles, it's duty was effectively complete unless it was called upon to act as launch command for another Titan I complex in the squadron. The ability of the Titans to "Hand Off" launch control to other Control Centers was a powerful redundant feature in the event that guidance or system failures rendered a site unable to launch it's own missiles. Each site was interconnected to all it's neighbors by buried cables that allowed any one Control Center to assume control and use it's computer and antennas to effect a launch. 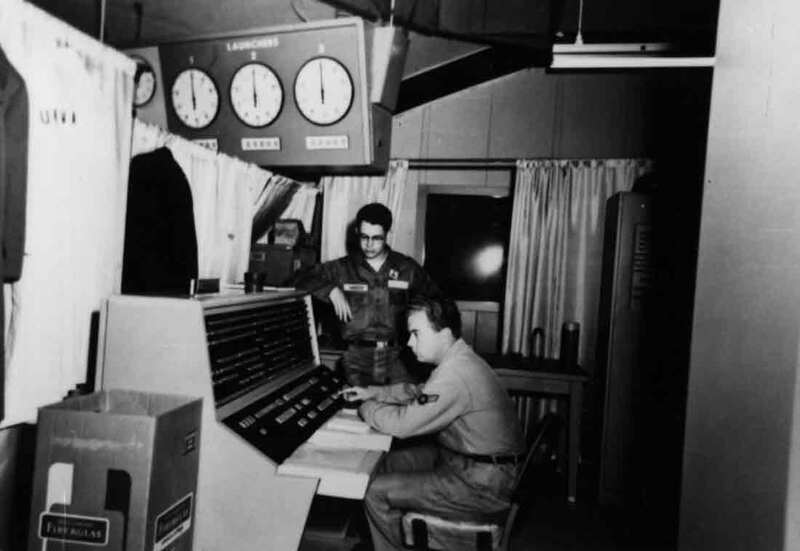 Bird dogs dutifully manning the Launch, Facilities and Guidance consoles in the Control Center circa 1962. This picture appears to have been taken during a Combined Systems Exercise (CSE) which would test the missile systems and facilities and keep the crew sharp on the procedures. 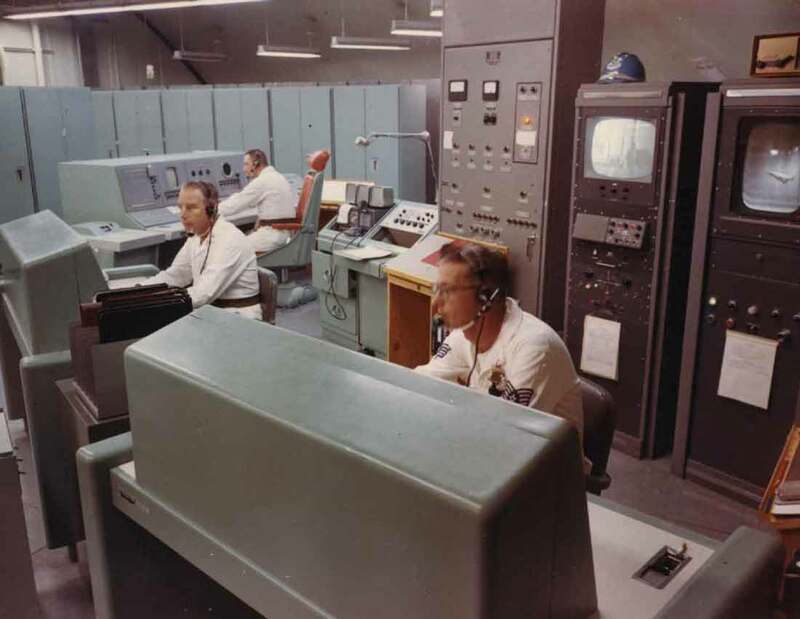 The monitors in the background would display the silo doors and missiles as well as portions of the underground complex. 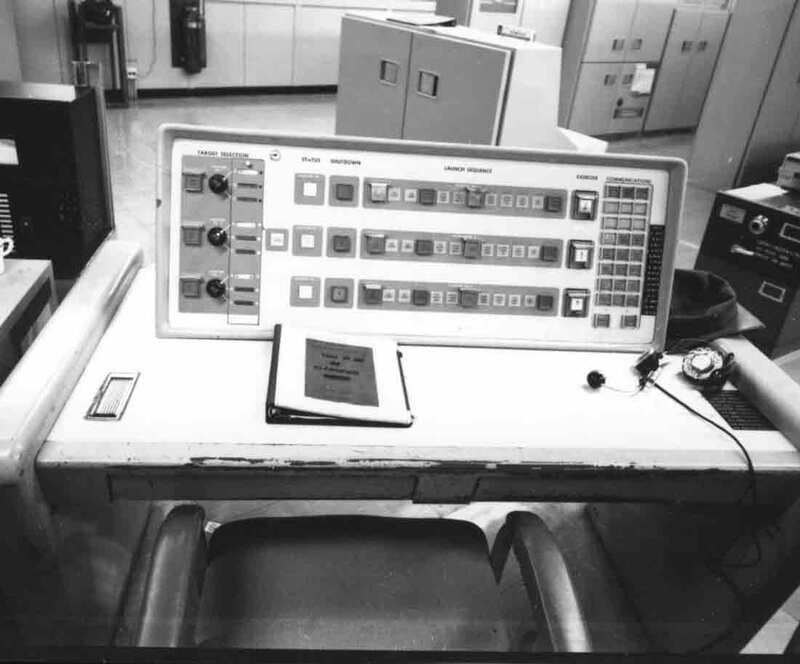 Note the ashtray (as mentioned) built into the Launch console at the lower right of the photo. "I'm sorry, I can't do that Dave." Tension mounts as the airmen struggle with "Halena" to get the silo doors opened. Vacuum tube computers were notoriously cantankerous. 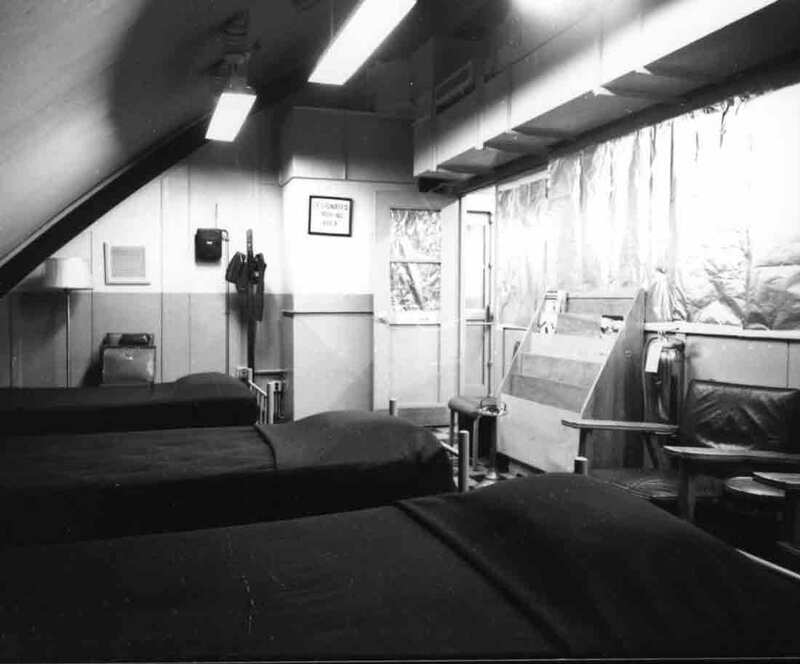 In this photo we can see the Operations room has been given the "lived in" look. I wonder who picked out the drapes? Uh oh! Cheese it! It's Colonel Proctor (far left) and his Ominous Entourage! Everyone look busy and get out the polish cause' here comes the brass! This picture may be from turnover of the site by the contractors to the Air Force, or perhaps it is only a walk-through inspection by the bigwigs. 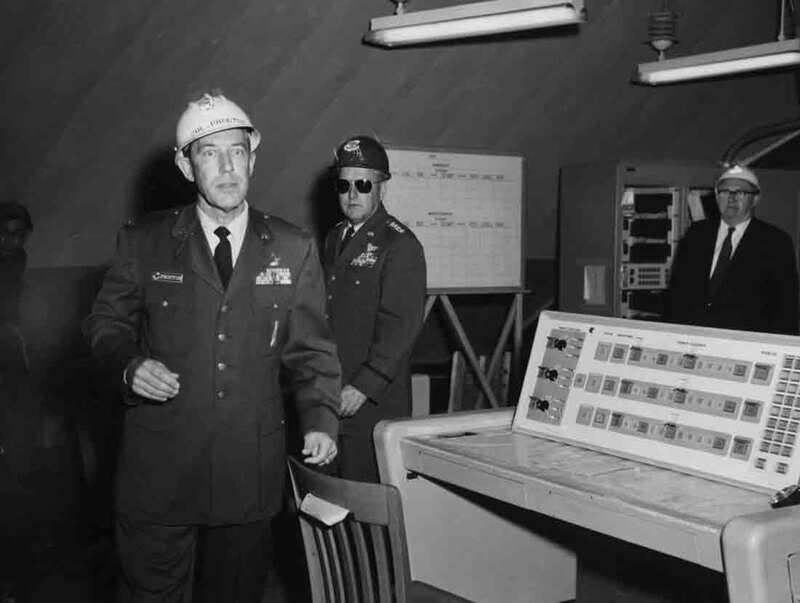 Not sure, but the man in the dark glasses has a definite "Dr. Strangelove" look about him. Colonel Proctor again, this time with what appears to be civilian contractors or important political types curious to see where the defense dollars went. Here, the guy in the center sneaks a peek at the launch codes. Above them is a beautiful shot of the launch clocks-- one dial for each launcher. As I had mentioned earlier, the Launch Complex Office went largely unused at some sites. 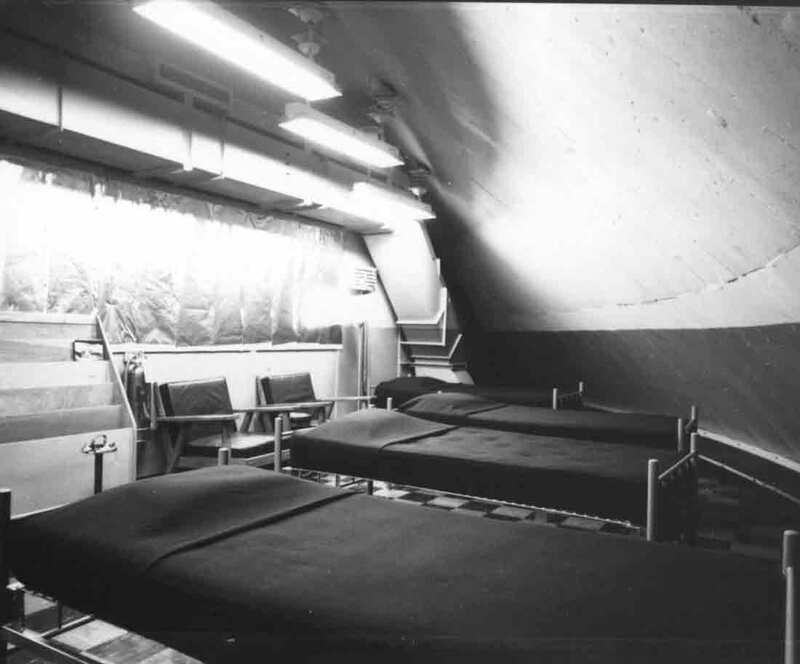 The following photo shows it outfitted with bunks, comfy chairs and Mil-spec aluminum foil over the windows that overlook the operations room outside. This picture is of one of the Lowry sites I believe. Looks like the magazine rack could use a few more copies of Popular Science and National Geographic to fill it out however. So instead of an office, apparently this area slept 6. Another shot of the Titan Motel.